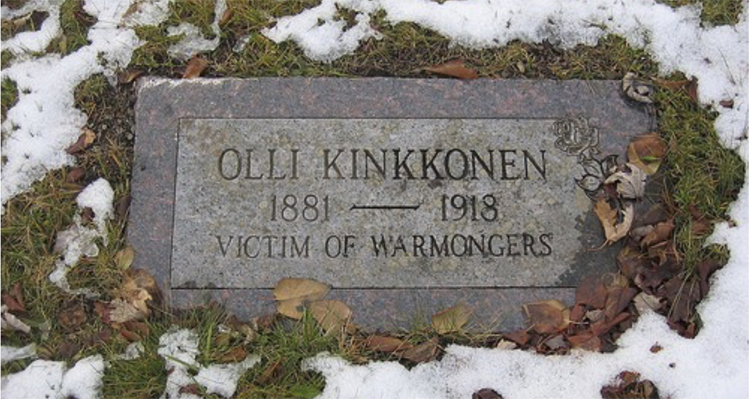 Olli Kinkkonen was an immigrant from Finland and, like many Finns, a Socialist. He refused to join the American army to fight in World War I and renounced his U.S. citizenship. Some say Kinkkonen considered the war an imperialist conflict, a struggle for economic power, an unjust war. Others say he was simply a peaceful man, a dockworker and logger who wanted no part of war and was mistaken for a more outspoken antiwar Finn. Whatever the case, Kinkkonen had made plans to return to Finland, but he never made it. Historians say it may not matter whether Kinkkonen was against the war, as anti-Finnish sentiment flourished in the area in 1918. What happened to him may have been as much inspired by ethnic bias as by politics. In September 1918, Kinkkonen was abducted from his boarding house bed by a group calling themselves the “Knights of Loyalty” (also referred to as the “Knights of Liberty” and “Sons of Liberty”), vigilantes who labeled those who did not join the army “slackers.” The group first phoned then sent a letter to a local newspaper, claiming that they tarred and feathered Kinkkonen as a warning to all slackers. Two weeks after the abduction, Kinkkonen was found hanging by his neck from a tree near Lester Park, covered in tar and feathers; $410 was found in his shoes. Duluth authorities ruled that Kinkkonen must have committed suicide because he was embarrassed about what had happened to him. His abductors—and probable murderers—were never charged. One local paper, The Truth, called the chief of police “unfit for office” and suggested that the Duluth Tribune knew the truth behind Kinkkonen’s hanging.